Summary: Being aware of your own speed can always come in handy, whether you want to avoid breaking limits, to verify your vehicle�s performance, your own, or just out of plain curiosity. So here comes my latest creation, SpeedoPhone. Being aware of your own speed can always come in handy, whether you want to avoid breaking limits, to verify your vehicle�s performance, your own, or just out of plain curiosity. So here comes my latest creation, SpeedoPhone, updated to the 1.31 release. If you have a WM device with GPS and you want to keep your speed under control, SpeedoPhone is what you need. You can use it when you�re on foot, in your car, on a train, on a plane, on boat or wherever you like. The app has a Windows Phone 7 look, nice, user friendly and pleasing to the eye; as for the possibilities and information it has to offer, here's what we've got. The first steps are the same as always: download the cab from the link at the bottom of the page, install it on your device, open it and you�ll get to the home page. It's simple and intuitive. The app will automatically get the GPS running upon loading, but it's possible to switch it on and off manually with the GPS button. Once the phone has found and fixed enough satellites to work with, the START button will be enabled. Click on it to start your record. 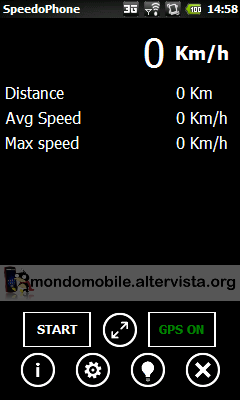 The first data available on the screen is the instantaneous speed, with Km/h as default measure unit. You can change it to miles per hour (Mph) or knots (Kn) by tapping on it. The app will also give you information on the distance you've covered, the average speed you�ve kept, the highest speed you�ve reached, how much time has passed, and - if you select the cost-per-kilometer option - how much it is so far. Select the button to keep alive the device, so not to let it go on stand by and have it automatically disable the GPS. The button, on the other hand, will activate the full screen option that further on we'll examine more in detail. Let�s now see the option menu instead, accessible via the button. From there, it's possible set a series of controls to keep your speed under check. By specifying a maximum value for the instantaneous and/or average speed, exceeding that limit will cause the speed indicator to turn red. If you'd like the app to work as a kind of taximeter, or if you want to know how much your travel is costing you, you can set a cost per kilometer. You can also specify how precise you want the instantaneous speed to be: an integer, a one- or a two-figure decimal. When the fullscreen mode is on we are also shown a series of buttons, showing different speeds, to switch quickly between the limits more common to us. And, last but not least, you can have the app record a log with the data of your travel. The app will remember our favorite settings also on each following use. Here, the menu where it's possible to select which limits to show on the fullscreen mode. Once we�ve got back to the home page, clicking the button will take us to a screen with more specific information, this time relative to the GPS signal. That means that we will be able to see how many satellites the device is able to detect, how many it has fixed, what is the current dilution of precision of the GPS, our altitude, latitude and longitude. Let's now see aspect and functions of the Landscape mode, activated by rotating the device. The home page is fairly close to the one we've already seen, except for the slightly different layout of the buttons. Tap on to activate the full-screen (also available in Portrait): since there are times when a lot of information is too much, and rather than being a help it just hinders us, on here you will only see the instantaneous speed, displayed as an integer and with a much bigger font, so to be clear and immediate. We'll find the Keep Alive button on there as well; as for the unit of measure, again, if you want to change it you only need to tap on it. In order to be aware if the device is working or not, if the GPS signal is strong enough to work with you'll see the icon appear on the left. And, at the bottom, the buttons to switch between preset limits. Some improvements have been made to the HUD mode. Accessible via the button, it will show a mirrored version of the regular display. Why that? Try and put your device on the dashboard, you'll get to see your speed projected on the windshield. I hope you'll find this app useful and that you'll enjoy working with it. It's available for free, but, as usual, if you'd like to say thanks a coffee would be nice. The app is available in Italian and in English, click on the image below to download it. * added the HUD option (mirrored numbers) when in fullscreen mode. * increased slightly the dimension of the font on the pages with info and settings. Please incorporate VR. I would gladly donate to the cause. Ever car should have this feature built in. This program is awesome! It works great and will keep your speed in mind. The HUD is fantastic. I let my son use it to keep away those nasty speeding tickets. The only drawback is switching your speed limit buttons while driving. This is a distraction! Voice recognition is the answer to this problem. You should be able to change speed settings via voice command. Please add this featureand you have a goldmine. beautiful. Well done and easy to use. Is there a chance to have a menu option to mirror the screen, and so if the phone is placed on the dashboard, the reflection in the windscreen will be like a "HUD"? Android has this app capability.